This recipe takes little prep and makes the most delicious, tender beefy sandwiches. You just can't beat juicy shredded beef piled high on a hard roll, topped with cheese, then dipped into a rich au jus. Trim excess fat from chuck roast. Place roast and onion in bottom of crockpot. Combine remaining ingredients except for beef broth and pour over roast. Add enough beef broth to barely cover meat. Cook on low for 7-8 hours. When done, remove meat from broth and place in bowl. Using 2 forks, shred beef, discarding any leftover fat. Strain broth for dipping. Set aside. Cut rolls or bread in half. Place on an aluminum foil covered cookie sheet. Pile beef on half of bread. Cover with slices of cheese. Place sandwiches under broiler and cook until cheese melts and starts to brown. 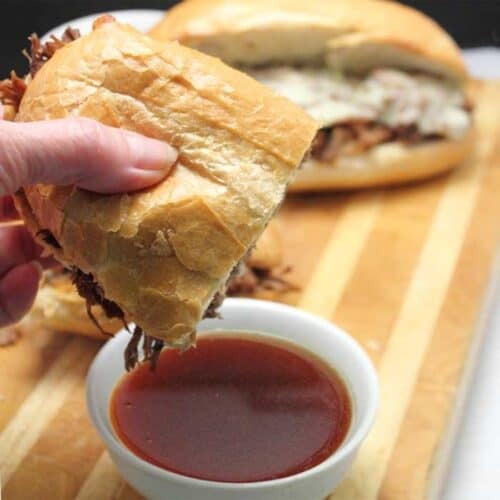 To serve, place sandwiches on plate with dipping bowls of au jus (beef broth) on the side.